Bless you Charles Martinet, for coming outside and giving all your fans including me a high five which makes a great consolation prize for those who were unable to bear the wait and cold anymore or had other obligations to attend to and had to leave. Bless some of you fans who gave me StreetPasses. I almost have all the pink pieces. But at the same time, I have been barely filling up my Plaza capacity of ten per time. Bless the fans right in front of me and back of me who have been entertaining me with their discussions, such as how Hillary Clinton once threatened video games in the past as KoopaTV brought up previously. Another discussion I overheard is about the Kanto-only Pokémon-themed tournament which only involves the first 151 Pokémon which I am not interested because a major flaw of the first generation games is that they did not have a Pokémon based on a giraffe which was rectified in the second generation games. Some discussion of Twitch Plays Pokémon was thrown in as well. I heard Anita Sarkeesian's name thrown in a few times. The most important discussion to me is when I heard discussion behind me about how Advance Wars seems to be sadly dead. People who know me well enough know that I am an Advance Wars fan so I am glad others are noticing as well. There was also a display that showed the time and temperature on the other side of the street where I was standing around this area. I would say I was standing around here from about 12:20 PM to 1:50 PM depending on the time, but still within the same area. At a bit after 2:00 PM this is where I was standing. Yes, it took that long to get there. I soon left the line shortly after getting around there as I had other obligations to attend to and it was too risky to wait anymore. Also the weather hung around a bit below freezing and a bit above freezing. My left leg was in a lot of pain that when I finally bailed out of the line. Thankfully my leg got better when I was in a warmer place and was able to sit on the subway the whole way home. I had many plans. To get Charles Martinet to do a voice request for KoopaTV and have him autograph my Super Mario 3D World disc as that is the video game my husband and I played the most together by far at this point. To record the store for KoopaTV. I did not do any recording at all on Friday. Thankfully there were others who did the recording. Here is a video by The Phawx. It was recorded from the back of the line, so despite me being in the video, you will only see me from the back. The other videos I saw so far of me on the line had my face down as I was playing on my 3DS during those times and did not even notice I was being recorded. I know there are recordings of me with my face up because I waved in some of those recordings including when Charles Martinet high-fived all those in the line including me. I'm still searching for a good video of me and my pretty face. Just because I came home does not mean I had given up yet. Nintendo NY was giving out Splatoon posters, a different one for each day of the opening weekend. I was determined to get one of them. Maybe even two of them. They would be both of the same type of poster but still two of them. I could do something like sell the extra, give to my Internet friend if we ever meet up or even give it as a reward for KoopaTV. 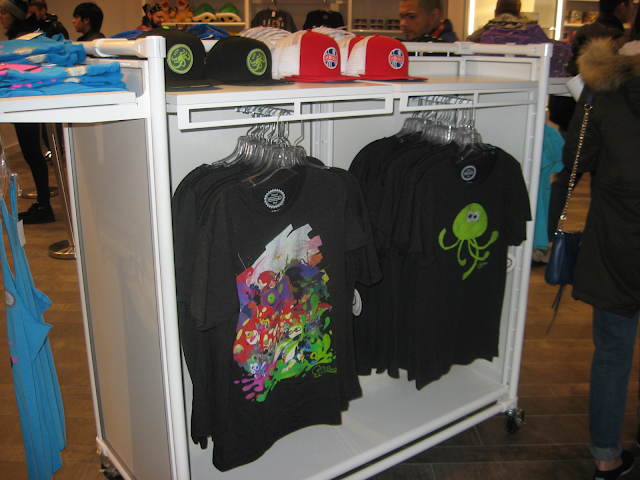 The difference between Friday and Sunday is that Friday had Charles Martinet coming, exclusive Nintendo NY shirts that are in limited supply and Fire Emblem Fate's release. Sunday really only had the poster and I did not think people would wait such a long time just for that. I got a bit worried that a security guard asked another security guard if they were to let twenty at a time. I know the store would be bigger than that and can fit way more than twenty people at a time but I figured they mean let twenty through the door at a time so the store won't get too overwhelmed and I was right. I got in the store and took pictures first including a section with adorable plushies that resemble a certain lovable prince. Sorry that a certain someone had to be there as well. 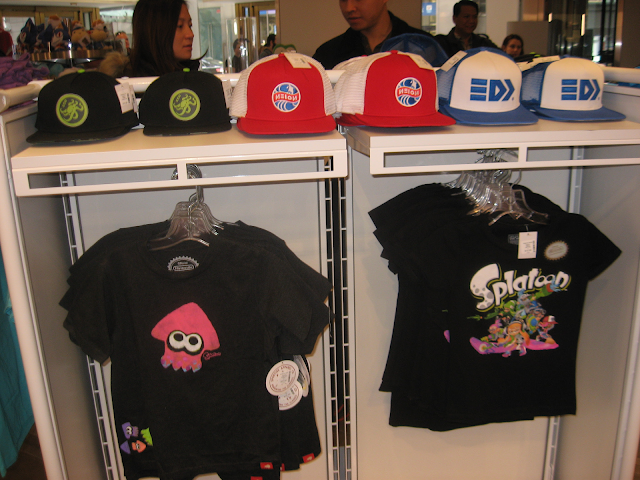 Here are other pictures with Splatoon merchandise in them. I own the shirt with the pink squid on it as well as all those caps. The shirt comes in youth sizes so I got it as an XL, which fits adults who can fit into small adult sizes. The reason why I am focused on showing the Splatoon merchandise is because of the panic that took place at Squidboards with people fearing the franchise is going to be abandoned because there was no Inkling DLC that isn't Mii costumes for SSB4. I just want to prove them wrong. I own these two black shirts. They do come in adult sizes. I then got tired of taking pictures so I decided to film the store instead, rather than pause and take a picture each time. I do have more pictures I took before filming, but I don't want to drag down this whole article with them if they can be seen in film as well. I filmed at different points and put them all together so I apologize for how choppy it can be as well as if it looks shaky. My lovely voice can be heard at some parts. 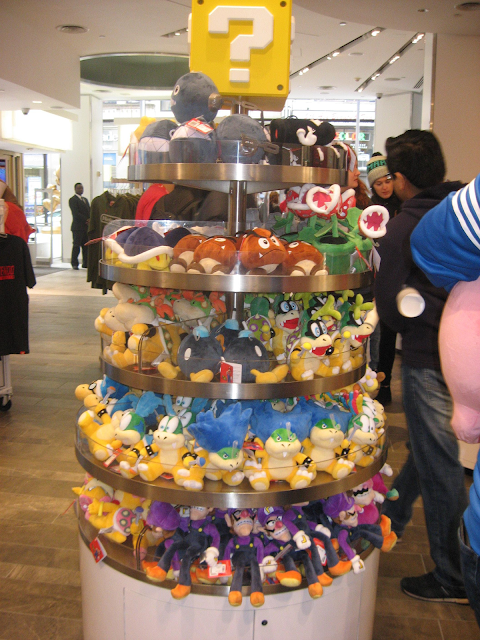 I also focused on an adorable plush replica of a certain prince here. Here are the caps at my home as well as one of the posters. 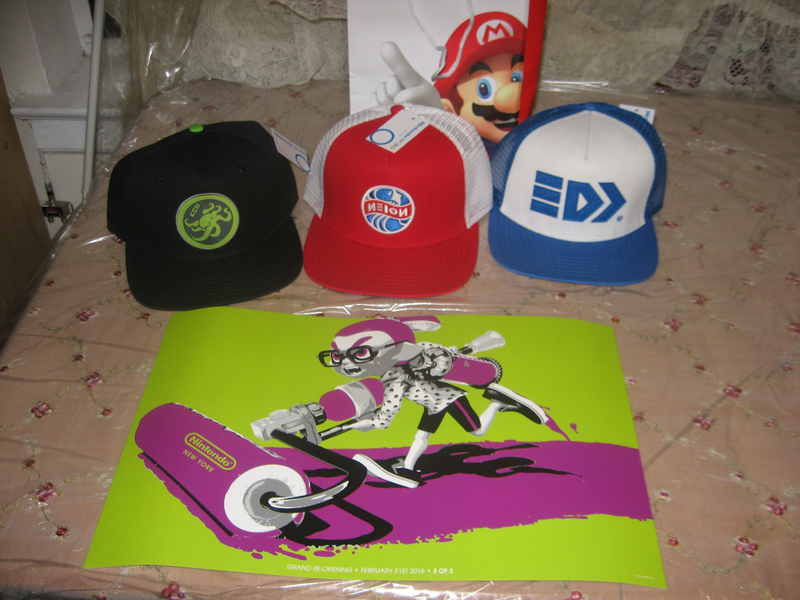 I would like to donate one of the posters as a KoopaTV reward but I know there are also people living in areas where the shipping cost will be even more expensive. 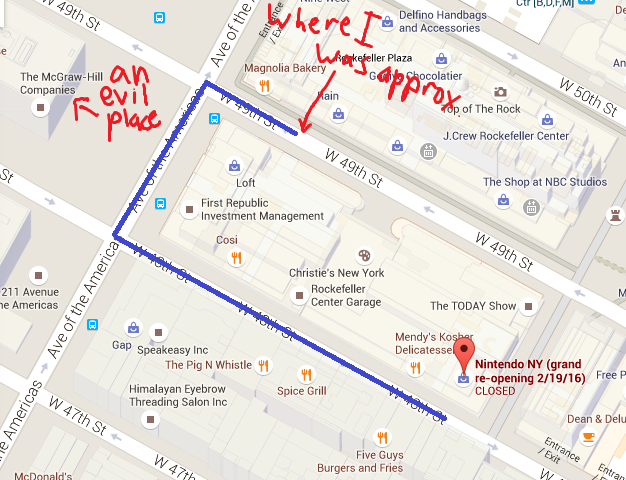 The lesson I learned throughout all of this ordeal is to never doubt what Nintendo fans will go through. I thought I was safe two hours before the store grand reopening and I was very much wrong. 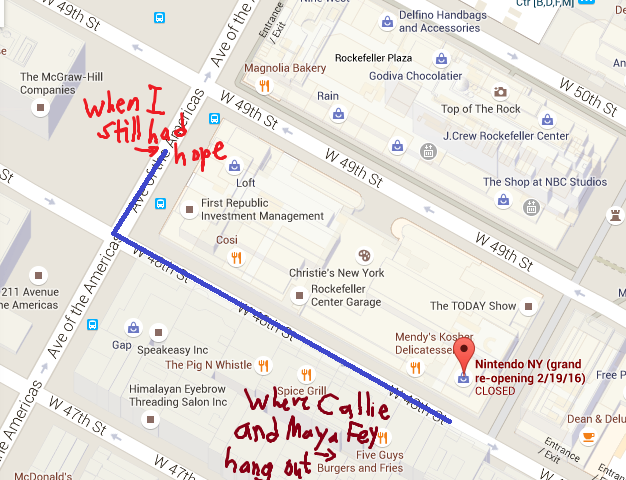 I also don't think I will ever go to a big Nintendo NY event such as this again but stick to lower scale events such as the New Super Mario Bros. 2 event I went to years ago which also had a line, but it wasn't unbearable. ShinyGirafarig can be found on Miiverse and DeviantArt. 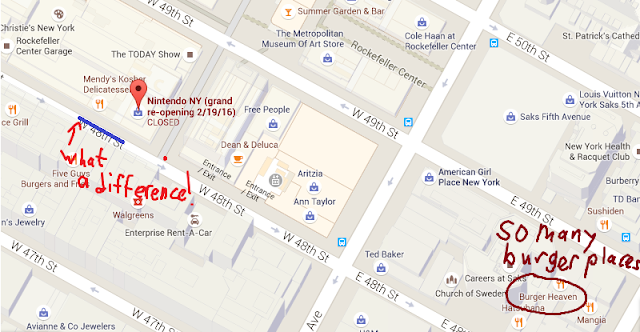 She hopes this article is very informative as not everyone can easily access Nintendo NY. ShinyGirafarig pleads for you to not ignore giraffes. Plus, her Callie plushie goes on squid adventures. 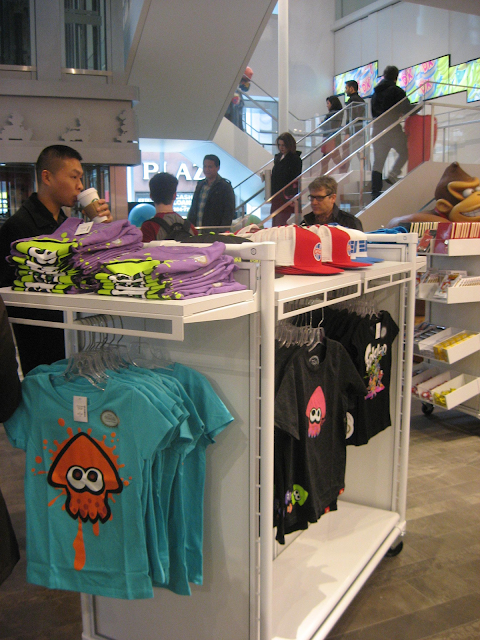 She tried looking for family-appropriate apparel at the Nintendo NY, but there isn't much. 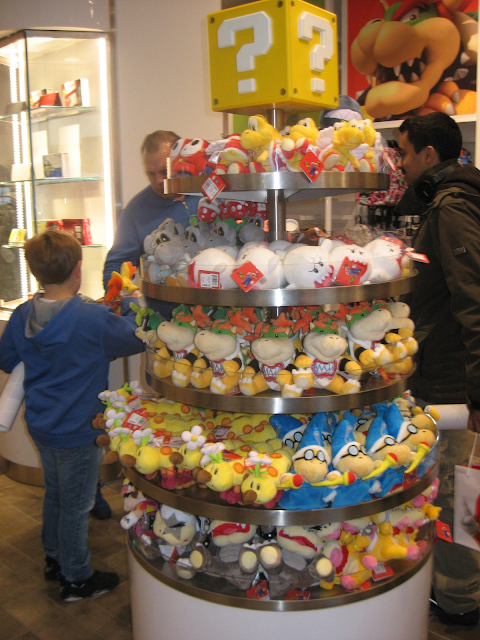 ShinyGirafarig bought a couple's Pikachu plush set here! ShinyGirafarig comes back to Nintendo NY to buy some things, and play an important game demo with her husband. That's me! According to reports I read and images and videos I saw, the Pokémon Day Event was pretty much the same in terms of lines and people unable to get it after waiting for such a long time. 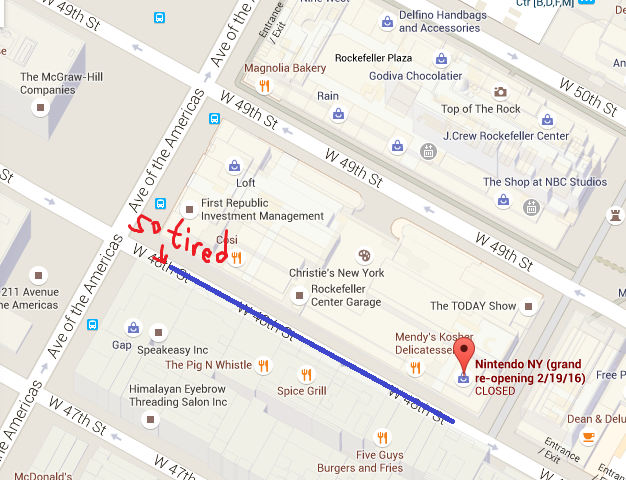 I think I will only go to Nintendo NY for non-event days and maybe for some events that are not in a grand scale like Pokémon. Not everyone gets to live in New York. Sometimes Nintendo calls it Nintendo NY, sometimes Nintendo NYC. I dunno wot it should be. Do they do events regularly or wot? I did shop for an internet friend in the past and got her a Splatoon shirt. It was when it was still called Nintendo World Store and before the temporary closing. I show the receipt and she covers for it as well as shipping. ...So basically you're saying you'll shop for us? If you want me to get stuff then I could do it. They usually make events for new releases. So March 18 is a DOUBLE EVENT, eh? if any one who has one of these posters is selling I'm buying! I have two and I could sell you one of them if you want. ShinyGirafarig can you please sell me one? i need poster 2 and 3 i will buy from any one who has one! I only have boy inkling with the roller one. I just got two of the same. So how are you reachable? Are you willing to wait until Friday for my husband to ship the poster? Will see if I can send the poster in the roll it came with to hopefully make sure it does not bend. I take Paypal but willing to also take Amazon points. hello thanks for a fast reply... i don't know what the safest way is to send my contact information so i will give you an old email i rarely use any more... it is downceo@yahoo.com if you will contact me there we can talk price... i really appreciate it and i look forward to talking to you soon!